The end of the year has seen Bitcoin broaching the $1,000 level for only the second time in its existence. Bitcoin reached its all time high of $1216 a over three years ago, facing the last level of resistance prior to crossing $1,000 at $980. That same level is now being tested again, and is proving to be resilient. 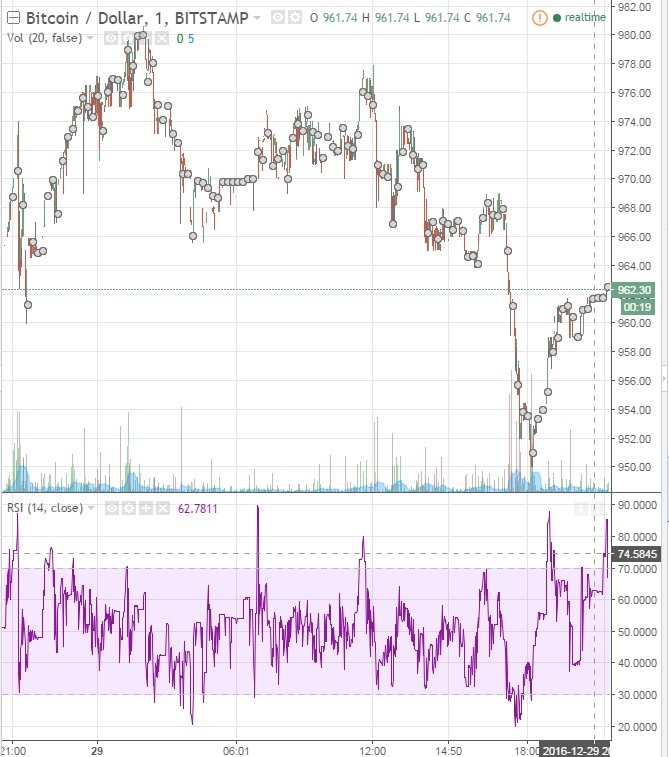 The TradingView chart below shows that $980 was tested and rejected soundly. Almost immediately upon hitting that historic resistance level a selloff occurred. Buyers bought into the weakness temporarily and attempted to test $980 again without success. Bitcoin is currently trading around the $965 level and has been volatile. Short-term traders are in a tough position right now. Looking at the Relative Strength Index on the above chart, we can see several times that the previously strong indicator of 70 is no longer valuable information. Usually, 70 marks the opportunity to open a short position and sell into weakness. This is not currently the case and makes pattern trading nearly impossible. The same is true for the inverse of 30, which usually signals a long trade opportunity that can be sold into strength. We can see several times 30 was passed, which produced several different results. Volatility, typically a boon for swing traders, is unreliable at the moment. Long-term traders are still in a good position. All of the previous catalysts remain in place, and suddenly the US Federal Reserve chairman Janet Yellen has shown she is willing to raise interest rates several times this coming year. Should the US Stock Market show weakness due to interest rate hikes, bitcoin stands to benefit. World volatility is also expected to rise with the ascension of populist US Presidential candidate Donald Trump. President-elect Trump has engaged in substantial trade war and nuclear weaponry rhetoric before even taking office. Steady and explosive catalysts both remain in place. The $980 resistance level has shown some strength, but fundamentally nothing has changed. The last 48 hours have still marked an advance from the $930 resistance level all the way to the current $980 levels. There is zero shame in profit taking however, do not be afraid to trim.